Alicja Zdrojewska graduated from Jazz and Contemporary Music Department of Stanisław Moniuszko Academy Of Music in Gdańsk. In vocal class of professor Anna Domżalska. She is kind and skilled teacher with years of experience on stage. 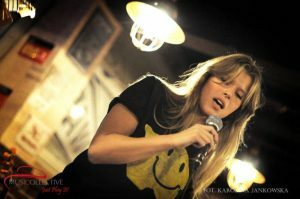 She provides tuition for Warsaw vocal lessons in our faculty. If you look for classical and opera singing lessons please write email, we provide this type of schooling. She started her music journey in Tri-city. There she started to cooperate with guitarist Rafał „Uhuru” Szyjer. She was responsible for tuition of 40 young children choir which recorded music album. This lead to understating of broad of musical characteristics needed to be effective in the process of musical development. Looking for new adventures she recorded single „Perfect World” with FRANKY band. Currently she works on personal project called Alula which is expression of her style and temperament. We put our focus on development of musical sensitivity and proper foundations. It is not just only loot at performing technique but also the ability to express while being on stage. The students can take part in yearly quartal concerts.